What do you remember most about this soap’s commercials? Now, before you get really worried, I do shower regularly, and I use a less pungent soap than Irish Spring. But do you know where Irish Spring can be quite useful? In the garden. As it turns out, deer can’t stand the smell of Irish Spring soap, and its shavings keep the pesky critters away from tender plants. If you are unfamiliar with the smell, then next time you’re at a store that carries Irish Spring, pick up a packet and smell it. But keep the shrink wrap on to soften the olfactory blow that Irish Spring delivers. You’ll understand why deer stay away from it. Despite my own feelings about its smell, I wish I had spread the odiferous green stuff out in the garden sooner this year. Future tree or deer treat? A few weeks ago, my husband discovered a volunteer sapling, growing up in the shadow of a larger lacebark elm tree we had planted several years ago. 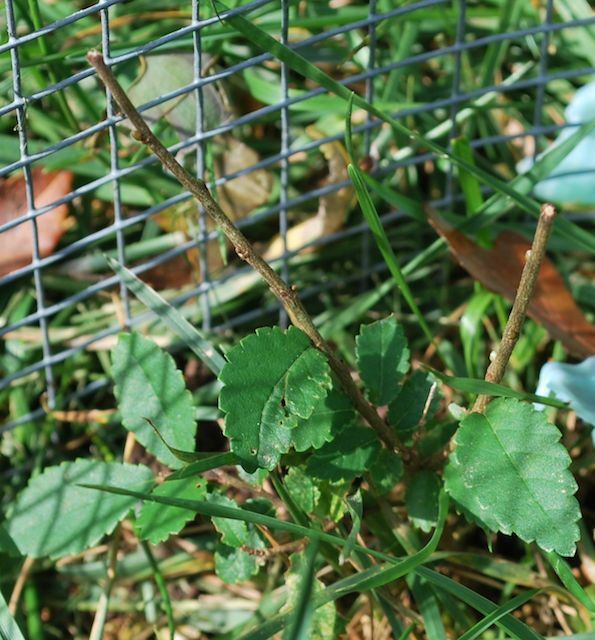 Each fall, the elm sheds seeds everywhere, but this is the first year we found any little volunteers growing. This particular sapling had grown and already branched out, and even had a smaller cousin growing nearby. We talked of keeping both saplings where they were and letting them grow a bit bigger and stronger before transplanting them, and my husband was careful to avoid the seedlings when he mowed the grass. Oh, the plans we made for those little trees. Those two twiggy antennae used to be filled with lacebark leaves. I had no idea deer would snack on trees, even if they were young, tender ones. I just hope we aren’t too late to save this one. I put a wire cylinder around both baby elms and shaved Irish Spring soap on the grass nearby. I also poked shavings on the wire spikes at the top of the cylinder to keep the deer from thinking I’d just framed their treats with a dinner bowl for them. Now we wait. And hope. And wait some more to see if this little elm will grow up to be a beautiful flourishing tree like the one that gave it life by dropping a seed. Why does this matter so much to me? Aside from my general (some may think, crazy) love of trees, this particular sapling had come to represent my own dreams. I have struggled in the shadow of others’ greater successes this year. But I know they, too, started out with just the seed of a dream. And so I don’t want to be jealous of their flourishing but, instead, want to celebrate their successes as my own little sapling of a dream strengthens and grows into what God wants it to become. So, yes, I take this deer attack personally. But I also want to see how God uses the sapling to teach me life lessons I need to learn. And so I wait. And hope. And strengthen. And grow. Join me next Wednesday for more on this struggle to lay down the green-eyed monster and hold fast to God’s promises for a fruitful future. Until then, may I leave you with a bit of practical caution? 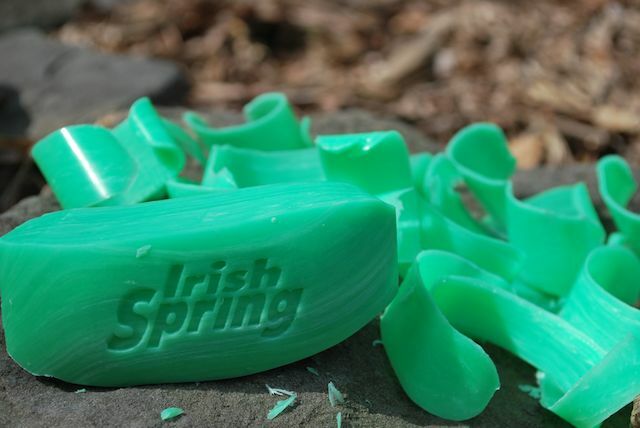 Irish Spring gets really slippery as you cut it, and so if you’re carving it with a peeler or cutting it with a knife the way they do in the commercials, please be careful. Don’t test out the antibacterial properties of the soap on a nasty cut. Take your time, and you may discover that the deer don’t find your garden so inviting any more. This entry was posted in flourishing tree and tagged Irish Spring, jealousy, saplings, trees by hopesquires. Bookmark the permalink. I've used it too with great results!Now every time I see it, I'll think of your post, Hope.